Still on the aftermath of the death of Late Sen. Adeleke, Angry supporters of the late Senator collapse canopy on Amosun, Akeredolu, Oyinlola in a bid to chase out Idiat Babalola, who is a commissioner nominee of Governor Rauf Aregbesola. Babalola who was seated among the dignitaries including the younger brother of the deceased, Deji Adeleke, was chased out by the youths who alleged that the former governor was poisoned by some APC leaders. The angered youths said Babalola was being tipped to become the running mate of the anointed candidate of the APC. 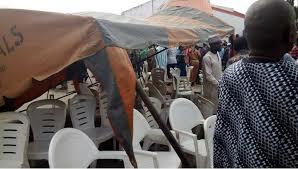 Problem started when Babalola was sighted by the mourners who demanded that she should be sent out. Despite pleas from family members of the deceased, the youths insisted and started shouting and raining curses on her. The youths started shaking the canopy where Governors Ibikunle Amosun, Rotimi Akeredolu, Prince Olagunsoye Oyinlola and Deji Adeleke were seated to chase out Babalola who they described as a betrayer. Babalola was escorted outside the house by Amosun and his security aides as the youths threw sticks and mango fruits at her.